Today’s 3-ingredient Elderflower Margarita recipe is brought to you just in time for summer sipping season. Cheers! We could hardly let Cinco de Mayo come and go without bringing you a chance to sample a new margarita, could we? 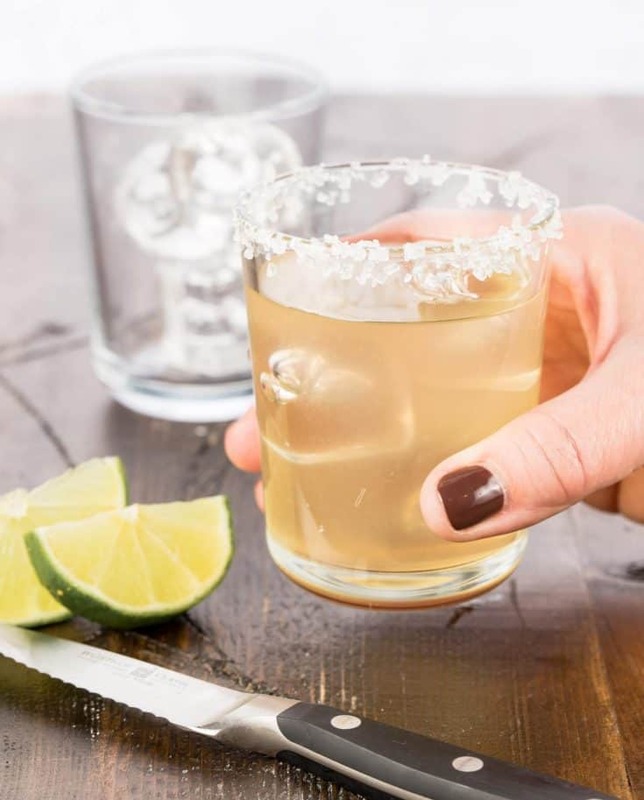 You know we take our tequila cocktails seriously around here, and this margarita is no exception. So grab a pitcher, a few glasses and some comfy deck chairs because this 3-ingredient Elderflower Margarita will definitely make you want to stay awhile! Now I’ll admit, as much as I love elderflower liqueur, I’ve never had it in a margarita. My first thought was that it would be too sweet, but boy was I wrong. The floral notes of the elderflower liqueur are a natural complement to the herbal, woodsy flavors of the reposado tequila. Add a shot of freshness with some tangy lime juice, and you have yourself a first-class cocktail. Plus you can just as easily make a big pitcher of these Elderflower Margaritas for an impromptu happy hour as you can make one for yourself after a long day. Simple? Yes. Dangerously so? Definitely. Make ahead tip: Stock up on limes when they are on sale at the store and juice a whole bunch at once. Freeze them in ice cube trays and defrost as needed. 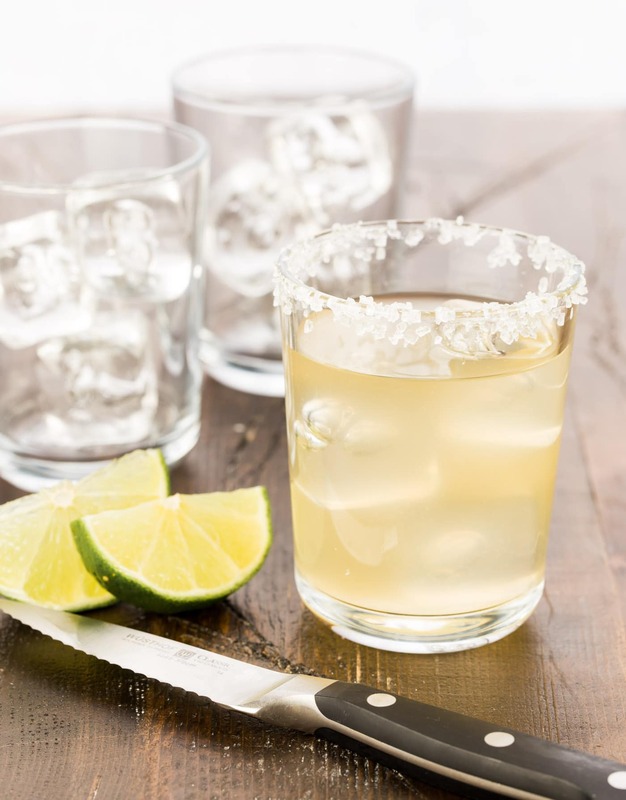 Place tequila, elderflower liqueur and lime juice in a cocktail shaker filled with ice. Shake vigorously for 20 seconds. Pour into ice filled lowball glasses (with salted rims, if desired). Margaritas are my MOST favorite cocktail! I’ve never tried elderflower, but I’m super intrigued! Love your tip for freezing the lime juice! my in-laws would love this!! You just might win a best in-law award with these beauties, Courtney! I love tequila so much, but elderflower liqueur has to be my favorite cocktail ingredient ever. Cheers to this! Couldn’t agree more; elderflower liqueur is surprising versatile. I was thrilled with how well it blended with the tequila! Now I know what reposado tequila is. I’ll definitely rest with one, or two, of these on the 5th.